This book investigates and considers the urgent political, social, and economic challenges that confront society and tourism. It attempts to look at what is threatening society, and makes suggestions on what the impact will be and how tourism will be changed to integrate with the new socio-economics of a newly emerging society with its novel peculiar challenges and opportunities in a post-energy era. 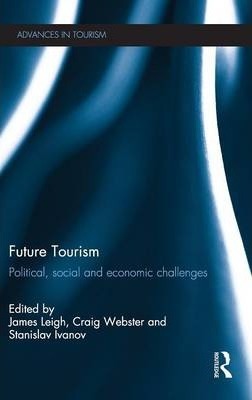 The book draws on the views of leading thinkers in tourism and considers a broad range of issues from multidisciplinary perspectives facing the tourism industry for the first time in one volume: dwindling energy, new technology, security (like war and terrorism), political economy, sustainability, and human resources. By critically reviewing these social and economic challenges in a global scale, the book helps to create a comprehensive view of future tourism in the unfolding and challenging society of the third millennium. This innovative and significant volume will be valuable reading for all current and future tourism professionals. 1. Introduction: What Future for Tourism? Part 1: Global Changes and Their Impact on Future Tourism 2. "Peak Oil" Confronts Society and Tourism: A Futuristic View 3. The Political Economy of Future Tourism Part 2: Political and Social Trends and Future Tourism 4. Security and the Future of Tourism 5. Wellbeing, Equity, Sustainable Development and Social Tourism in Twenty-first Century Europe 6. Shapers and Shifters for the Future of Travel and Tourism 7. Tourism and Quality of Life 8. Through a Glass Darkly: The Future of Tourism is Personal Part 3: Managerial Issues and Future Tourism 9. Tourism in a Technology-Dependent World 10. Human Resource Issues in the New Millennium 11. Sustainability: An Issue for the Tourism Industry in the New Millennium 12. Tomorrow's Tourist and the Case Study of New Zealand Part 4: Concluding Thoughts 13. Future Tourism: Where to Now? Dr. James Leigh is Assistant Professor of Cultural Geography in the Department of Hospitality, Tourism and Sports Management, School of Business, at the University of Nicosia, Cyprus. Dr. Craig Webster is Associate Professor of Political Science in the Department of European Studies and International Relations at the University of Nicosia in Cyprus. Dr Stanislav Ivanov is Associate Professor and Academic Director of International University College in Dobrich, Bulgaria.